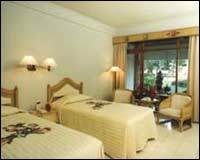 Set right at the heart of Sanur, Natour Sindhu Beach Hotel is a quiet enclave of rooms and bungalows situated amidst tropical gardens. The white sand and warm blue waters of Sindhu Beach are only meters away and each morning a magnificent sunrise awaits you at your doorstep. Provide easy access to discover the whole beauty of Bali, 20 minutes drive from the airport and 10 minutes from Denpasar. Beach market, art and gift shops, nightlife's and tourist spots are in walking distance. The hotel has been designed to reflect the traditional beauty of Balinese architecture while incorporating all the comforts and services of an international hotel. Rooms and Bungalows scattered fashionably in the green refreshingly garden atmosphere overlooking the clear blue breathtaking ocean of Sindhu at it's charms. You can choose to relax on the beach, in the gardens or on your own balcony or verandah. All rooms and bungalows are equipped with fully air conditioning, private bathroom [bathtub and shower] with hot and cold water, minibar, satellite television, IDD phone, in-house music channel, private balcony or verandah and 24 hours room service. Restaurant, Cafe, Bar, Meeting & Party Facilities, Table Tennis, Swimming Pool, Children Pool, Children Playground, Beach Recreation, Sport Activities, Parking Area, Traditional Massage, Safety Deposit Boxes, and Laundry Services. Evening Performances, Money Changer, Internet Service, Tour Desk, Baby Sitting, Gift Shop and Drug Store. - Special rates are inclusive Airport transfer in private car. 4 Nights accommodations, Sunset Dinner Cruise, 2 hours Lulur spa treatment for Couple, Photo of Balinese wedding Costume; Bedugul Tanah Lot Day Tour; Lunch and dinner in the top restaurants; Uluwatu Tour; Kecak Dance and jimbaran BBQ Seafood cafe; and Free time with your Spouse, Return Airport Transfer, Air-conditioned Car with Guide at your choice or languages.